– Part two of our discussion with The Grappler! In this installment, Lynn Denton tells us about how he was paired with Tony Anthony to form both The Grapplers and the Dirty White Boys. We talk about their runs in Southwest, Memphis and Mid South. Lynn also shares his memories of booking in Kansas City, the scariness of Killer Karl Kox, riding with Rick Rude and the death of Gino Hernandez. As always with The Grappler, it’s a fun and informative talk! – Sportscaster John WIlsbach joins the show to discuss a WWF charity show he brought to his high school in March of 1983. This is a cool look into how schools worked with the WWF to put on shows shortly before the company expanded nationally. John shares the story of how this show came to take place, which was during the height of Jimmy Snuka’s popularity. 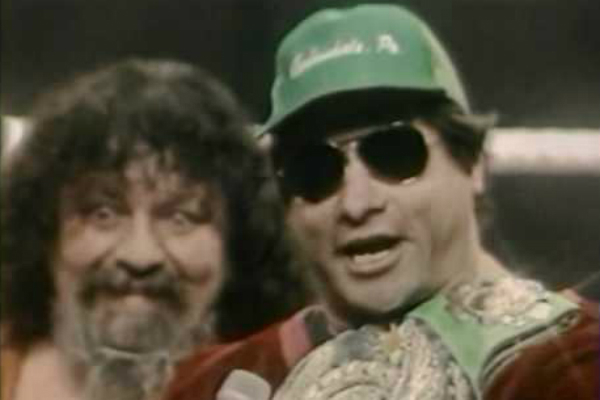 John also recites the Don Muraco and Lou Albano promos that were sent to the school to promote the event! – Dolph Ramseur of Ramseur Records joins the show to discuss growing up in the Carolinas watching Mid Atlantic Wrestling and why he chose to be the first sponsor of The Superpodcast! – TGBL & Bowdren The Booker talk about name topics, including 1986 UWF, some of wrestling’s most hard hitting angles, mid-1980’s Florida, Ted DiBiase, Tully Blanchard, Lex Luger, the wardrobe of Tommy Rich. Jeff also talks about his elevator run in with Bull Nakano, his old Observer column and his new book, which is our Book Of The Week! The Top Ten is sponsored by Bombadil’s new album “Fences” on Ramseur Records, which can be purchased at independent record stores, iTunes & other online retailers!